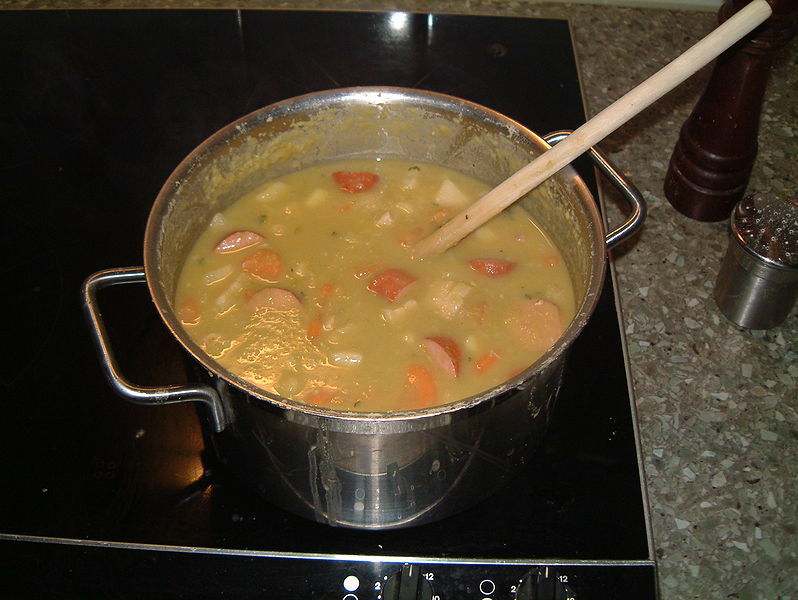 Erwtensoep, also called "snert", is the Dutch version of pea soup. It is a thick stew of green split peas, different cuts of pork, celeriac or stalk celery (Apium graveolens var. dulce), onions, leeks, carrots, and often potato. Slices of rookworst (Dutch smoked sausage) are added a few minutes before serving. 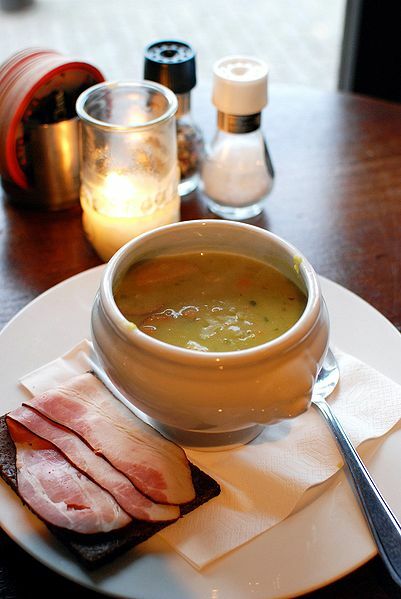 Left: 'Erwtensoep, roggebrood met katenspek': Dutch for "pea soup, rye bread with smoked bacon"; it is a traditional combination in the Netherlands. The soup, which is traditionally eaten during the winter, is emblematic of Dutch cuisine. The thick consistency of the Dutch pea soup is often described as that "you should be able to stand a spoon upright in a good pea soup". It is customarily served with rye bread (roggebrood) and bacon, cheese or butter. The bacon is always 'katenspek', bacon which has first been cooked before being smoked. The pork and sausage from the soup can also be eaten separately on rye bread together with mustard. Many so called 'koek en zopie' outlets, small food and drinks stalls which only spring up during winters along frozen canals, ponds and lakes in the Netherlands and cater to ice skaters, very often serve "snert" as a hearty snack. Left: Snert - dutch pea soup. For other types of pea soup see Finnish pea soup and Erbsensuppe (German pea soup).